A while ago I modified my Weber Q140 electro barbeque to a gas grill by replacing the heating system and the grid with the Q100 parts and installing the piezo ignition. 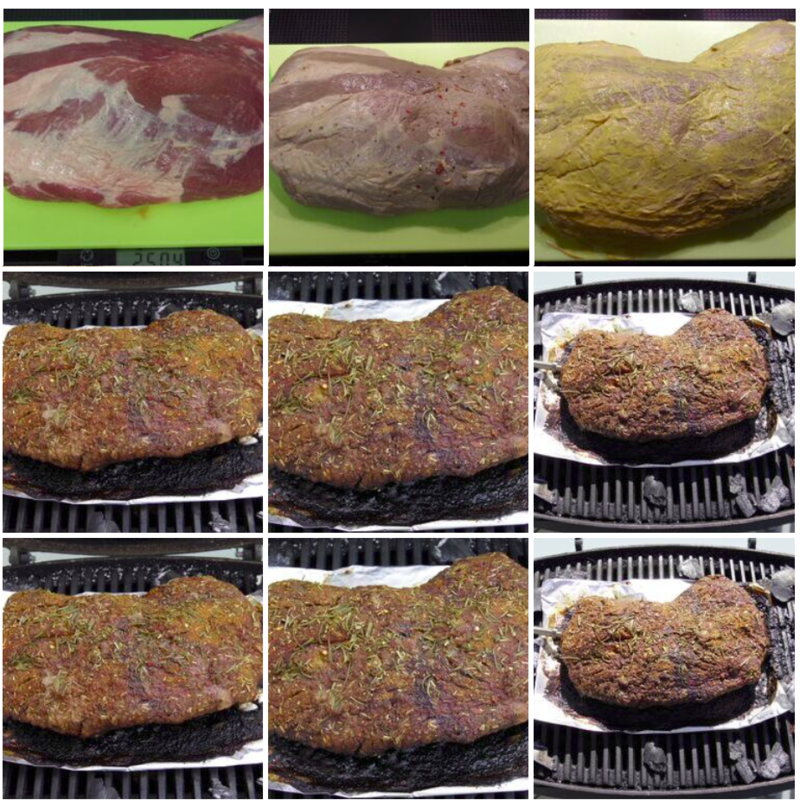 Although the result was not different than any other over-the-shelf Q100 gas-grill, the flame size seemed rather small and the regulator response was poor (which are known problems of the small case Webers). As the simplest improvement I checked the cooking chamber temperatures and heat-up characteristics with bigger main jets. The european version is equipped with a 0.73mm diameter main nozzle for the 50mbar pressure regulator. First I tried a 0.85mm nozzle, then a 0.90mm nozzle (which you can buy in many good store for oil-fired house heating systems (its a M6x0.75 thread and a standard dimension nozzle)). The test cycle was 20min full power from cold-start, then 10 minutes idle power. With 0.85mm a definite increase in temperature gradient and end-temperature could be observed. The 0.90mm nozzle did not lead to any measurable increase, so the bottle neck seemed to be elsewhere. I assume that the air mesh at the venturi mixer has not sufficient surface-area for higher gas flows. This also means, a variable pressure regulator could help a little with higher gas velocities but would not increase power infinitely due to the mesh area. Based on these results I finally installed the 0.85mm nozzle. This modification gave me enough heat and power (2.6kW nominell with the gas system and 0.73mm main jet vs. 2.2kW of the electronic heater) to sizzle the beef as desired (the peak in the green curce at 9min was a little far burning, so disregard). While searching for new challenges the idea grew to advance to the low & slow section by making pulled pork. For this special preparation, a cooking chamber temperature of 100°C-130°C was widely suggested and indications were found that the gas heater on its lowest powersetting would not allow for temperatures below 150°C. A second drawback was that the gas regulator makes it easy to select a fixed gas-flow/power but does not regulate the temperature which would be essential here. The simplest solution was to reinstall the electric heater which already features a temperature regulation with the inbuilt thermostat. Unfortunately there was no information availabe for the lowest working point of this regulator so this should be added here. The picture below shows the cooking chamber air temperature in degree-Celsius (measured with a thermocouple 6cm above the grid, shielded by a 15x15cm piece of aluminium foil on the grid). After approx. 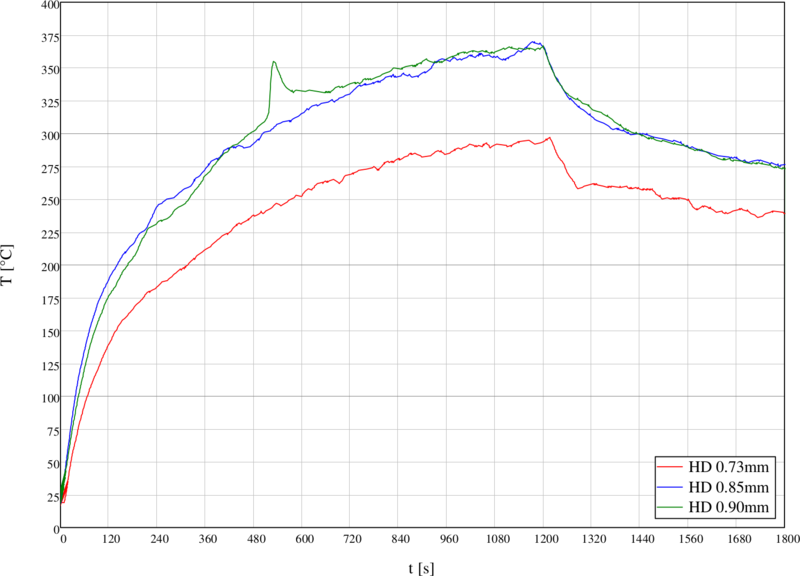 1/2 hour the grill leveled out at roughly 260°C (correction of +6K applies to the shown values) on full power. The test was conducted in January with +4°C ambient temperature, so for typical summer party climates, the maximum cooking chamber temperatures could be easily 10K higher than measured. The regulated temperatures for intermediate powersettings should be theoretically independent of the ambient temperature. At estimated 25% powersetting, the temperature was reglated between 100°C and 150°C. With the minimum setting the operation points went down between 50°C and 100°C. These values are low enough for a really slow pulled pork. The regulation hysteresis with 50K is relatively high but it should be kept in mind that the thermocouple measurement sensor is less than 0.5mm² of metal and has therefore only very few thermal capacity. 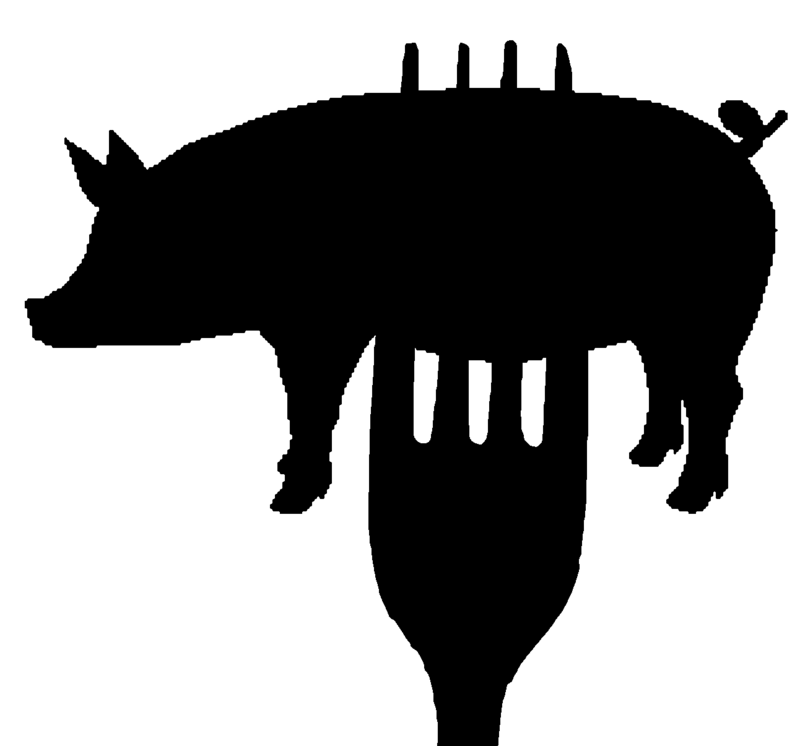 A good chop of pork, having 2-4kg on the scale should not be irritated deeper than a few millimeters by the high hysteresis, so the whole thing is worth a try. My first attempt was with 2.5kg of boneless pork neck, pretty much the biggest size you can get in one piece. There are two K-type thermocouples in use for temperature logging, one permanently installed centrally 2cm below the ceiling of the cooking chamber and one probe directly in the meat for the core temperature. Both are logged on a laptop via two UT-61c DMMs. I adjusted the thermostat setting to 110°C the day before and marked that setting on the scale. At the beginning (03:00 o'clock in the morning) I started to heat the barbeque with full power to reveal the intense flavour of the cedar wood chips I used for smoking. A little bit too much as the wood ignited and the cooking chamber went up to 600°C. A good way to test my alarm settings in the temperature logging software which I intended to use while the grill was doing what a grill should do during the moring hours. I blew out the flames (well, no beer at hand at 3 o'clock in the morning) and tried again with less power and no fireworks this time. 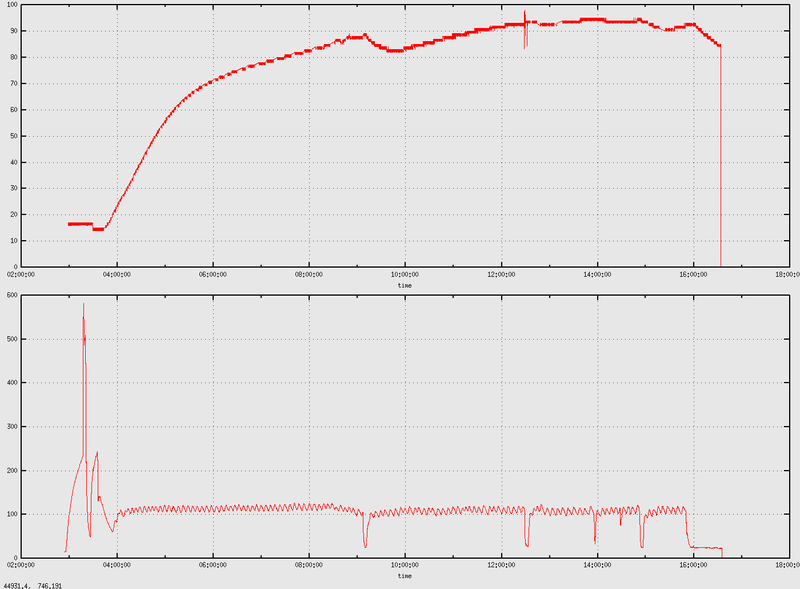 Above you see the core temperature at the top and the cooking chamber temperature at the bottom over a time scale of hours. The spike to 600°C was the wood chips buring in flames, the spikes to the bottom reside from opening the cooking chamber for applying the mop and spurious nosiness. I adjusted the temperature scale in the chart below so that the more important cooking temperatures can be seen clearly. Whilst the minimum temperature experiment above was measured with an empty cooking chamber and ahysteresis of over 50K was measured, this time the massive meat lump damped the hysteresis to less than 15K which is acceptable. Nevertheless, a noticable higher thermostat setting was required to reach 110°C cooking chamber temperatures now, so I readjusted the setting. From a later point of view, maybe this was not a good idea since the first plateau with 65°C core temperature was reached already after 1.5h and the melting phase was not very prominent. 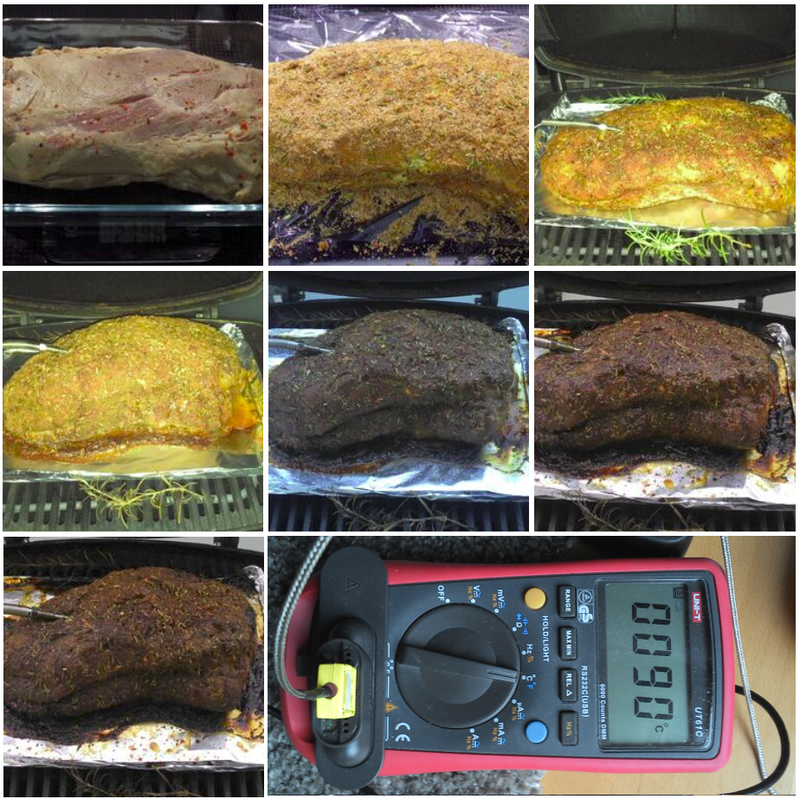 Over all, the cooking process went on too fast which might be a problem of the high hysteresis of the temperature regulator (reducing the cooking chamber to 100°C did help a bit but after 10h the core themperature reached 95°C and the pork was basically finished). Next time I will started with lower cooking chamber temperatures and adjust it later in the process. After 12 hours and several mop sessions, this is what I finally got. Although things went quite fast and a second plateau phase could not be noticed, the meat was gorgeous in taste and was soft and smooth as commonly renowned for pulled pork. Basically, the first attempt was a success but since thinks went quite fast regarding core temperature rise (almost 0.6K/min) the task was open to make things better. I am almost convinced now that the grill brings in the heat mostly from the bottom (due to the almost 85% covered grill area), so that when the cooking chamber thermocouple under the lid reaches 100°C, the bottom side of the meat experiences much higher temperatures and therefore heats up too fast. Therefore I reduced the cooking chamber temperature to 80°-100°C (based on what the thermocouple would read) and the rise time to 60° could be stretched to 3h (compared to less that 1 hour last time). At 5:30 logging time (and even more at 07:00) rain set in which had strong influence on the cooking chamber reading (obviously the water drops cooled the lid considerably). After the rain stopped (at approx. 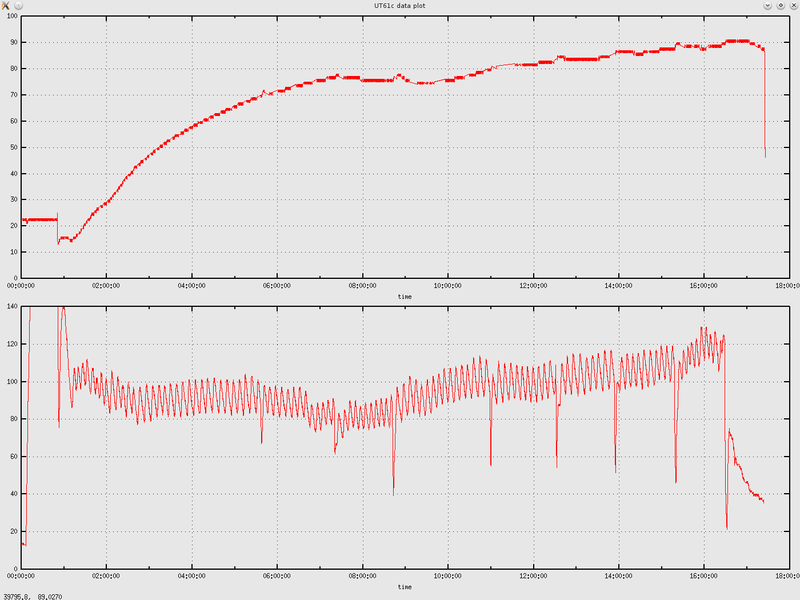 09:00), the temperature reading rose again and I also slowly increased the thermostat setting to slowly reach 90°C. This time, the first plateau at 65°C (melting of grease) was not very prominent but therefor the 2nd plateau at 78° (whatever happens there) was good to see. Anyhow, 90° was reached at 16:30, just 1h before the hungry folks felt in, so it was a landing on the spot and again a mere culinary pleasure. As always, I am still wondering where the 29% of mass (up to 40% in the first attempt) have gone through the process. Maybe mass continuity is a myth and Lomonossow-Lavoisier was wrong, but plan a little more for each person as you will loose some good fraction of wheight!